Scientists announced that they have discovered 10 previously unknown moons orbiting Jupiter. This brings the gaseous behemoth’s total moon count up to 79. The team, led by astronomer Scott Sheppard, first spotted some of the new moons while looking for exceptionally distant objects at the brim of our Solar System, beyond Pluto, using the Blanco 4-meter telescope at the Cerro Tololo Inter-American Observatory in Chile. Jupiter just happened to be in their view, and they noticed a handful of new objects near the planet, between just one and four kilometres in diameter. After tracking the objects’ orbits for about a year with other Chilean telescopes, in addition to some in Arizona and Hawaii, the scientists were able to confirm them as moons. Last year, this same team announced the discovery of two other moons, which brought Jupiter’s total at the time to a very nice 69. Two of the newly discovered moons orbit close to Jupiter—thought not as close as the large, Galilean moons: Io, Europa, Ganymede, and Callisto. 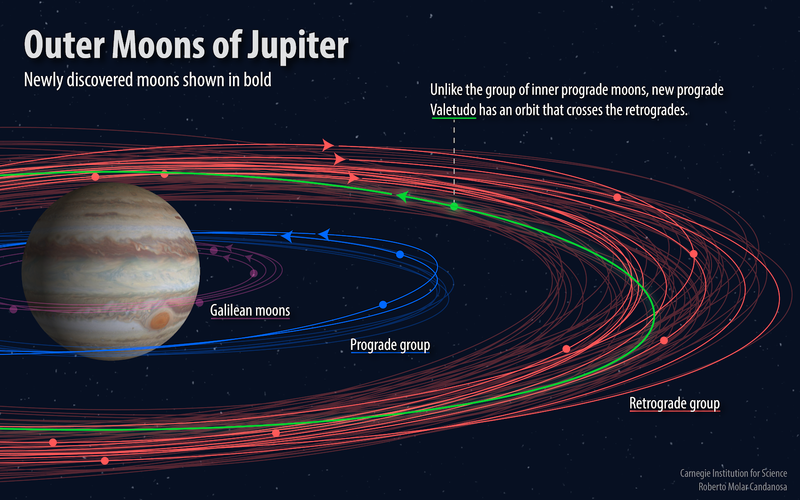 These moons are “prograde moons,” meaning they orbit Jupiter in the same direction the planet spins. Because their orbits put them near other prograde moons, they’re thought to be bits of a larger moon that was broken apart by a collision long ago. Seven of the new moons orbit a bit further out, and in the opposite direction, making them retrograde moons. There’s a throng of other retrograde moons in that further-out region, which fall into three distinct groupings of similar orbits. The researchers think those three groups were once three larger moons that were also broken apart by collisions. And then there’s the tenth moon—the oddball. It orbits in the same general path as all of the retrograde moons, but in the opposite, prograde direction. Sheppard told Gizmodo that it could be a remnant of some random object in the Solar System that got sucked in by Jupiter’s gravity—like a rogue comet, for example—which smashed into some of the retrograde moons, and broke them into the many that orbit the gas giant today. Though that errant object no longer fully exists, the oddball moon could be a fragment of it. The team proposed the name Valetudo for this moon in the kooky orbit, after the Roman god Jupiter’s great-granddaughter, according to the release from the Carnegie Institution for Science. The reason these moons are just being discovered now is because telescope technology has improved so much over the last decade or two, Sheppard told Gizmodo. Astronomers can take bigger, higher-resolution pictures and are less affected by glare and scattered light from planets. As telescopes continue to improve, Sheppard expects we’ll find even more moons orbiting Jupiter, since it’s so massive. Alycia Weinberger, an astronomer also from Carnegie who wasn’t involved in the new discovery, agrees with Sheppard. Additional moon discoveries could help reveal more about the history of Jupiter and other gas giants, because moons are often a window into how a planet formed. Jupiter, for example, formed in a spinning disc of dust; gravity caused a bunch of mass to compact together and create various rocky and gaseous objects there, which eventually smashed together to create the gas giant we know today. But some leftover junk from Jupiter’s birth that didn’t get sucked into the planet continued to orbit in the original direction of the disc, and what would be come the eventual spin direction of Jupiter. Those are prograde moons. The team thinks that Jupiter’s retrograde moons, however, are mostly made up of a passerby objects from elsewhere in the Solar System that Jupiter vacuumed up and captured with its gravity. Understanding moon-planet relationships like this one could be especially useful for studying other solar systems and exoplanets. Scientists discovered the first exomoon just last year. No matter the case, moons of any kind are worth paying attention to.